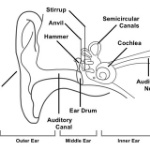 the sound goes through the auditory canal and hits the eardrum which makes it vibrate. this makes the small bones vibrate (the stirrup, anvil and hammer). this makes the liquid in the cochlea vibrate. cells at the bottom of hairs in the liquid of the cochlea make an electric signal. if light reflects off a rough surface it will still obey the law of reflection if you change the angle of the normal line.